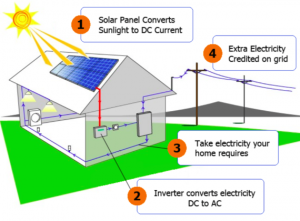 Residential Grid connected Photovoltaic (PV) Systems – Quantum Renewable Energy Inc.
With the end of the MicroFIT program, Net Metering is now the best way to get solar connected to the grid. Inverter – changes DC electricity produced by the PV modules into high voltage AC electricity. 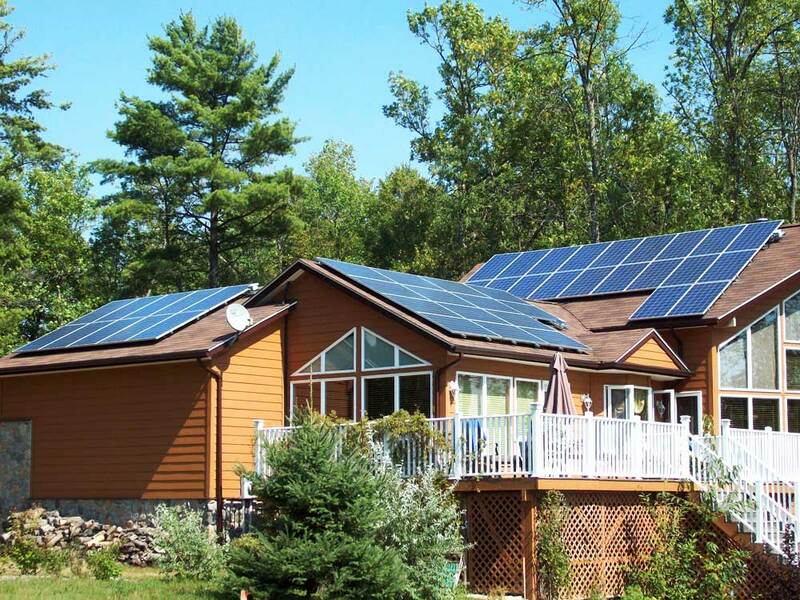 By installing a grid-connected solar photovoltaic (PV) system under Ontario’s net metering program, you not only become part of a grassroots effort to decentralize the production of energy in Ontario AND make it greener, but you can also save money by doing so. Grid-connected systems do not require battery banks, which increases their efficiency as well as lowering the system cost and maintenance requirements. PV array/ Solar modules: A series of silicon cells covered by a sheet of protective tempered glass. Through the PV effect, these cells convert solar radiation into DC electricity. A number of PV modules for what’s known as an array. Inverter: An electronic device that changes DC electricity produced by the PV modules into high voltage AC electricity. 2. The electricity runs through the wires to an inverter. 3. The inverter converts the electricity from DC to AC. 4. The electricity gets sent out to the grid via a dedicated meter; you get paid for each watt you provide. The rest of your household electrical system remains unchanged. How long does a solar energy system last? The standard lifetime of a system is 25 years; however, with proper maintenance it can surpass this. How much does installing a solar energy system cost? Typical costs are now below $3000 per kW installed; however, they vary depending on the size of the system being built. Please visit our Site Evaluation page if you would like a firm quote. What are the maintenance requirements for my solar energy system? As grid-connected systems have no batteries or moving parts, regular service is not required. Installation time for grid-connected systems varies depending on the size of the system. For a typical 10kW solar array, 3-4 days is a reasonable time frame. All of our systems carry a complete two-year warranty on installation and labour. Most modules are typically warrantied for 25 and inverters for 10-25 years. A 25% deposit is taken at the start of installation, with the remaining balance due within 30 days of completion. Net-metered systems put the sun’s energy to work directly for you. Any solar energy produced is first used in the home to power any appliances, electronics, and lights that happen to be on at the time. Any excess goes out onto the grid and registers as a credit on your meter. This credit can be used when the sun isn’t shining or during inclement weather. The credit lasts for one year. Ideally, a net-metered system is designed to produce more power than you need during the summer and carry a credit over through the winter, effectively zeroing out your electricity usage. What if Hydro cancels my contract? TThe contract is between you and the province of Ontario. It’s a 20 year guaranteed contract. It is independent of the utility or political party. What if I want to cancel my contract? The contract binds the province for a 20 year term. You have an exit clause which allows you to cancel your contract with 30 days written notice. If electricity rates equal the MicroFit rate, then you can cancel and go net metering so that your systems earns you more money. Does Canada have enough sun to make PV generation worthwhile and profitable? Absolutely. Canada has more solar potential than Germany and Japan; the current leaders in installed PV capacity. Financially, most microFIT systems, over the duration of a 20 year contract, will yield a return on investment of 12-15%. For comparison’s sake, the annualized average rate of return on the Toronto stock exchange over the past 20 years is about 9%. How long will a PV system take to pay itself back? An average microFIT system takes approximately 6-10 years to cover installation costs. For the rest of the 20 year contract the owner is making pure profits. What’s the difference between a net meter and feed-in tariff system? In a net-metered system, electricity produced by your solar panels is used to offset your electrical costs (and credit is received if you generate more than you consume). In Ontario’s feed-in tariff system, you directly sell the electricity produced to the Ontario Power Authority for a period of 20 years. How do I know if installing a solar array will work on my house? Having a roof with a large amount of south-facing surface area is ideal for solar power generation because in the northern hemisphere, this is the side that receives the most sunlight (especially in the winter). However, depending on how steeply angled your roof is, it is definitely feasible to have arrays in other orientations. The effectiveness of solar modules is dramatically reduced by shading—if 5% of the panel is covered by shade it will lose 50% efficiency. Therefore, it is important to ensure that there are no trees, buildings, or other obstacles that could shade your array. The use of micro-inverters or optimizers will minimize the effect of shading, but not eliminate it.